This post contains Amazon affiliate links. If you click on the link and make a purchase, I receive a small commission at no cost to you. This commission helps sustain running Realm of Vibes. I love running with my dog, Bailey. Some people would classify my “running” as a light jog or brisk walk, but we have a lot of fun exercising with one another while getting our Whistle and FitBit activity minutes. Whether you are just starting out with walking or are an avid runner, here are some of my tips for running safely and easily with your canine companion. 1.Get doctor and veterinarian clearance. It is important to make sure you can physically handle exercise. Schedule a physical and consult your doctor about starting a walking/running program. Bring Fido in for a check-up and get clearance as to how many miles you can walk/run with your dog. Bailey is cleared to run up to 10 miles with me. When I was training for a half marathon, we ran up to 8-9 miles. It’s imperative that you start slow; make sure you do an adequate warm-up for both you and your dog. 2. Know your dog and plan your route. I prefer running early in the morning, or 60-90 minutes before sunset at a park. I like a clear trail, opposed to running on the street. Some streets in my development don’t have sidewalks, so running with Bailey (or foster) can be dangerous. She also likes to run ahead of me, so that’s why I typically avoid street running. Depending on the season, you want to make sure your dog can handle the temperature. I like to run early or late in the day, especially during the hot summer months. I don’t know what I would do without my Tuff Mutt – Hands Free Dog Leash . The leash clips around my waist, has a bungee cord with a carbineer that clips to Bailey’s collar or harness. It has a short and large handle so I always have control over her movements. It is also reflective, so we are noticed by pedestrians, cyclists, and vehicles on our path. Hydration is super important, whether you are going on a short or long run. I have a few different tactics for handling both of our water. First, I wear a Hydration Belt. around my waist. I usually fill one with water, and one with a sports drink. If I go on a short run, I bring a Collapsible Dog Bowl for Bailey’s water. Sometimes, I bring a Gulpy Water Dispenser which is a water dispenser. I clip it to my waist with a carabiner or I carry it for added resistance. Whatever you do, make sure you have enough water for both you and your dog and that you take plenty of water breaks! Musher’s Secret Pet Paw Protection Wax is my go-to product before a run. It is easy to apply the hypoallergenic, nontoxic wax to Bailey’s paws, which gives a nice protective coating to prevent accidents on the trail. You know what they say, an ounce of prevention is worth a pound of cure. I love my Fitbit Charge 2 Heart Rate + Fitness Wristband. I have been using a FitBit since it came on the market and helps keep me accountable regarding exercise. I like the FitBit Charge 2 because it has a relaxation setting where it prompts you to do 2 minutes of breathing exercises. I also like knowing which heart rate range in which I am exercising. Bailey has a Whistle Activity Monitor. This shows how active she is throughout the day. We try to give her at least 60 minutes of daily exercise. It clips around her collar. When we had a pet sitter, we could see how long she was taking her on walks, and I could look at her stats from work to see if she is destroying my home. I think the Whistle is well worth the investment. Running with your dog can be a great form of exercise! I know that after our runs, we both feel great, and get a better night’s sleep. How do you exercise with your dog? Leave a comment to let me know! Best Bully Sticks – GIVEAWAY! *This post contains affiliate links and sponsored items. If you click on a link and make a purchase, I earn a small commission to help support this blog. Bailey is my two and a half year old rescue dog. We became best friends the day my husband and I adopted her. Bailey is my confidant, my side-kick, my running partner, and my little realm of happiness in this crazy world. There is nothing better than coming home from a long day at work to see her excitement that I am home. I cherish my walks with her every morning and night. Bailey is a beautiful dog; she is energetic, fast, and mobile, which we attribute to her clean diet and exercise routine. Bailey is just like her mom; she LOVES her snacks! Her mom, however, always makes sure that she eats well and gives her the finest of treats. These are beefy treats suitable for dogs of all life stages. These could be broken up easily to be used for training. They are softer and chewy. Approximately 20 treats come in the bag. Thoughts: This was Bailey’s FAVORITE! She LOVED these! I posted an Instagram video (@realmofvibes) of my princess eating the Bully Snack Bars. I would absolutely purchase these because she scarfed them down! They don’t stand a chance in my house! These sticks are 30-50% wider than BestBullySticks standard bully stick. My husband liked these in comparison to other bully sticks I have purchased because they do not have a horrid smell. Bailey is selective when she decides to indulge in these, but it took her close to two hours to chew from 12″ to 3.” I like that these are free of chemicals, preservatives, and additives. This is a fantastic choice for aggressive chewers. Thoughts: When Bailey decided to chew on these, she was a very happy dog. She laid on her dog bed like a primadonna and licked and chewed until her hearts content. I would purchase these in the future. The foster dogs would go CRAZY over them and they would be a great time occupier. This big bag contained 3 lamb ears, 3 pig ears, and 3 cow ears. The lamb and cow ears are lighter in color than the pig ears. These are for light to average chewers and contain no preservatives, additives, chemicals or hormones. Thoughts: Unfortunately, Bailey only liked the pig ears. She would lick and chew the pig ears instantaneously, but she would just carry around the lamb and cow ears in her mouth and drop them into her toy crate. Now – I donated the lamb and cow ears to the rescue. Dogs are similar to humans in the fact that we don’t like every food option in the world, right? Whatever you do, don’t throw anything out – please donate it to your local shelter. There will be a dog that likes what your dog does not. BestBullySticks has a lot to offer. 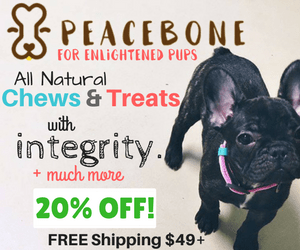 Their website is loaded with different bully sticks, dog chews and treats, bones, food, supplies, toys, dental treats. They also have products made in the USA and an extensive sale section. One thing I feel that BestBullySticks could improve upon is the quality of the packaging. The seal doesn’t work well and the Ear Variety pack bag ripped on the side. I wound up putting all of the treats and chews into large freezer bags. On the website, in small fine print, is says to put the treats in the freezer or refrigerator because they don’t contain preservatives. I would make the print bigger on your website and add this to the packaging. I like how all of the treats are 100% natural, approved by the USDA, and 100% digestible. BestBullySticks is located in Richmond, VA. I would absolutely purchase from BestBullySticks in the future. They have so many great products that Bailey would love to try! BestBullySticks is offering a giveaway to TWO lucky winners. Each winner will receive the three items listed above. Contest begins on Friday, March 24, 2017 at 12:oo AM and will end Friday, April 7, 2017 at 12:00 AM. Contest is open to continental USA residents ages 18 years or older. Winners will be selected through Random.org. The winners have 24 hours to respond via e-mail or another winner will be selected. Be sure to visit BestBullySticks on Facebook, Instagram, Twitter, Google+, YouTube and Pinterest. Disclaimer: I reviewed items from BestBullySticks in return for a review and posts on social media platforms. All views within are authentic and my own. Have you considered featuring your business or service on Realm of Vibes? Please visit my Collaborate page or e-mail realmofvibesdg@gmail.com to get started. Always supervise your dog when giving any chew or treat as they can become a choking hazard.